You know it’s just going to be one of those days when you have to wake your flatmate up with a text message informing them that there was some sort of explosion in your room and that the electricity for the entire flat is no longer working. Uhh… sorry Adrien. But burning fuses aside, after five weeks here I am finally beginning to shake off that on-holiday mentality and have begun to think about doing some actual studying. The problem is that I don’t seem to actually have any work to do… Despite doing more ECTS credits than Edinburgh require, I’m only taking five lectures a week here – and even they are condensed into just three days (four day weekends – score). We are set very little compulsory reading, and most of that is available as short extracts online. Still, actually understanding what is discussed in lectures is easier said than done. So, aside from the rare occasions when a guest lecturer decides their German isn’t all that great after all and opts for English instead (my happiest lecture to date), I have taken to jotting down the key dates/names/literary movements mentioned and researching these online after the class. God bless Wikipedia. I should probably mention at some point that there’s been a bit of a demonstration going on at the University for some weeks now. 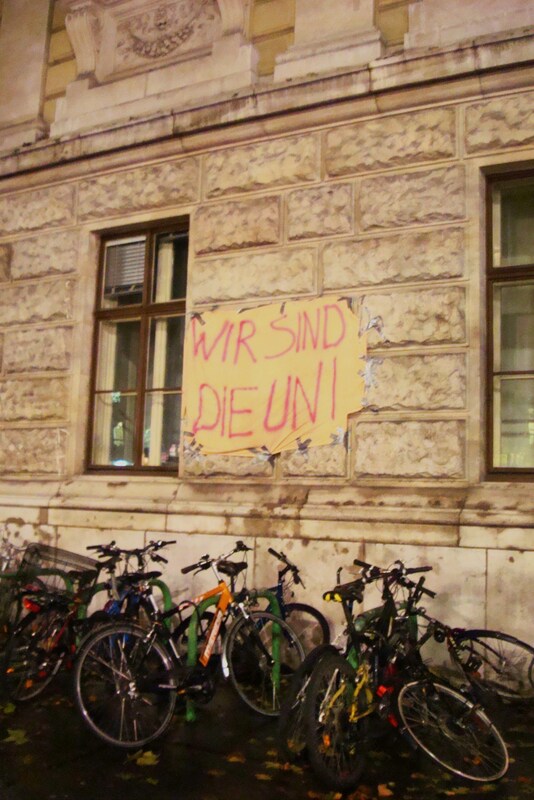 In protest against the re-introduction of tuition fees in Austria (which, I should add, are pitifully low compared to the amount we pay back home) thousands of students have commandeered the main lecture theatre, where they have been living (sleeping, cooking, and partying) until the Government agrees to protect their free education. Whatever cause they were originally fighting for seems to have got a bit lost in the free food and reggae concerts that are now going on over there. But I suppose that can’t be all bad. As for my long weekends, I’ve fallen into a wonderful routine of Friday night parties, Kaffee und Kuchen on the Saturday, and an Erasmus Family Afternoon with my friends every Sunday. 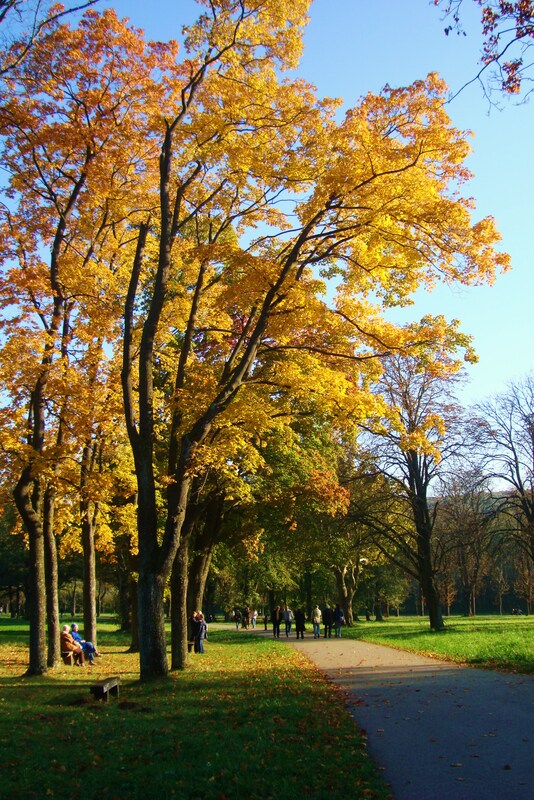 There are so many parks and pretty little villages around Vienna that we are spoilt for choice deciding where to take our weekly stroll to see the sights. Last week, we went to Lainzer Tiergarten: the Habsburg’s former hunting park and now a huge nature reserve on the very edge of the city where you can see huge wild boar, deer, and mouflons (a kind of wild sheep). It was another beautiful Sunday. And the perfect recovery from Friday’s various impromptu parties! After mid-week lectures, I’ve been taking advantage of Vienna’s cultural scene – and the 4 Euro standing-tickets at all of the major theatres and opera houses. Ok, so I do feel like a bit of a peasant coming straight from class in my jeans and hoodie and being ushered into the standing pen while the rest of the audience arrive in ball gowns and top hats, but the shows are absolutely incredible. I took my parents to Swan Lake the other night, and went with my friends to the ballet Mayerling, based on the romantic double suicide of the Habsburg Prince Rudolf and his lover – a story which Austrians are absolutely fascinated with and you will be told repeatedly should you ever come to Vienna. 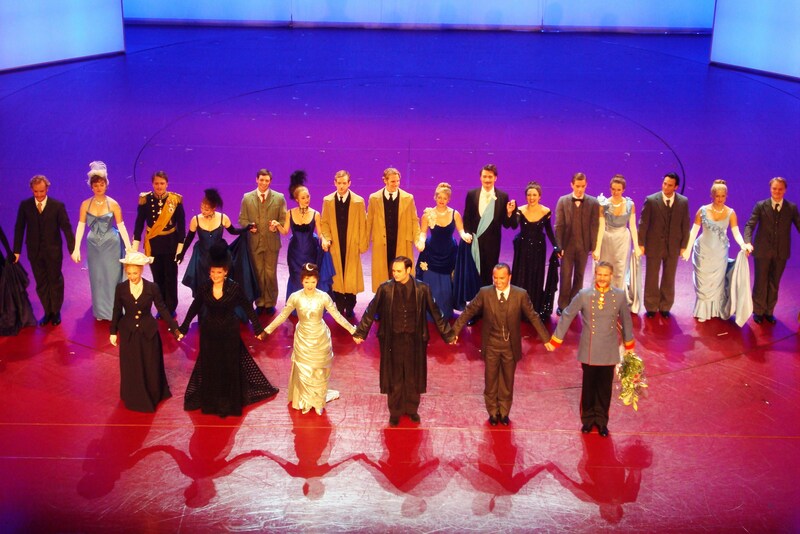 The following week we went to the Raimund Theater to see the musical retelling of this same story, Rudolf: Affaire Mayerling. Disappointingly, we had to fork out a whole 5 Euros this time, but we got great seats (yes, seats) and met up with the lead actor (a bit of a celebrity in Austria) after the show. Not bad at all, considering it was half the price of going to the cinema.